As the leading event for all DocuWare Partners, DocuWorld Europe offers an intensive training and continuing education program alongside networking at all levels. It also provides a great chance to hear the latest from software and hardware companies at this year's accompanying trade show, to find out about new products, solutions and integration options. In addition to meet-ups at their own booths in the Partner area, some companies will take the opportunity to present their own custom solutions with presentations on Wednesday, 4/10/2019, from 1:30-2:00 pm. This includes Neffe Consulting, which specializes in integrating DocuWare into SAP systems using record recognition, the replacement of third-party archives with DocuWare, and its own array of programming services. +++"Automatic Document Recognition and Processing with DocuWare and AncoraDocs" – See how the combination of DocuWare and AncoraDocs empowers effective document recognition at down to the item level to further process data in DocuWare and/or an ERP system like SAP Business One or Dynamics NAV. This integration can also be combined with DocuWare's Workflow Manager. (Neffe Consulting's presentation will be in German). Objectif Lune provides modern, leading edge technology with OL Connect. OL Connect enables resellers of content services solutions to be involved earlier in the lifecycle of customer documents directly from the point of data integration/document creation, with more of a focus on the customer and on increasing the value of their offerings. +++ "Increase Your Sales Value with Interactive Information and Documents" – Learn how to get the most out of interactive information and documents to provide top reseller service excellence. OL® provides the ultimate document design and workflow technology to help its customers differentiate themselves in a competitive market environment and provide a true end-to-end solution. (Objectif Lune´s presentation will be in English). With over 30 years of experience in manufacturing scanners, Plustek is an established player in the modern document management market. The company‘s product portfolio ranges from space-saving mobile devices to large-format scanners. Their eScan network scanner series, for example, offers broad connection options in combination with an easy-to-use 7" touch display, various software integrations and its own scan apps. +++ "The Smart Way to Digitize" – Plustek network scanners are perfectly suited for decentralized digitizing. Learn how integrated device software makes it easy to import documents directly into any DMS system – with simple configuration and without a connected PC. The API interface of the devices allows custom adaptations and the development of your own scan apps. (Plustek's presentation will be in German). Validated ID provides security trust services for electronic signature and digital identity verification processes. With ViDSigner, the company provides a SaaS service for in-office and remote scenarios. It combines the simplicity of use with the security of cryptography and biometrics. +++ "The Easiest and Safest Way to Integrate Electronic Signatures" – Validated ID supports companies in ensuring security, trust, efficiency and legal compliance through digital signatures and verification of digital identities. Learn how VIDsigner - a digital cloud-based multi-channel signature service - combines cryptographic security, biometrics and ease of use for every situation - from remote to face-to-face applications. Their electronic signatures are easily integrated via REST API. (The Validated ID presentation will be in English). As a provider of business process automation solutions, including intelligent document classification and advanced data capture, ancora Software, Inc. offers a modern and easy-to-use solution with ancoraDocs - incorporating patented artificial intelligence and machine learning technologies. These help companies avoid costly manual steps, including document classification and analysis. Canon is known as the world's leading provider of digital imaging solutions and offers a wide range of fast, reliable and easy-to-use scanners. The compact dimensions of these document scanners make them ideal for use where space is at a premium. Epson Deutschland GmbH is a leading supplier of printers, scanners and projectors for companies, public clients and private customers – and is now coming to Mallorca. Especially for retail and business clients, Epson offers products and solutions for large format scanning, cash register label and ticket printing. Epson also offers a wide range of document scanners for various applications - from mobile use and scanning on the road and in the office to network scanning solutions for large enterprises. Panasonic develops high-quality, reliable and innovative communication solutions. In addition to multifunctional designs and sophisticated features, their solutions not only meet the increasing demands of vertical markets, but also flexibility and future-proofing with extremely low environmental impact. 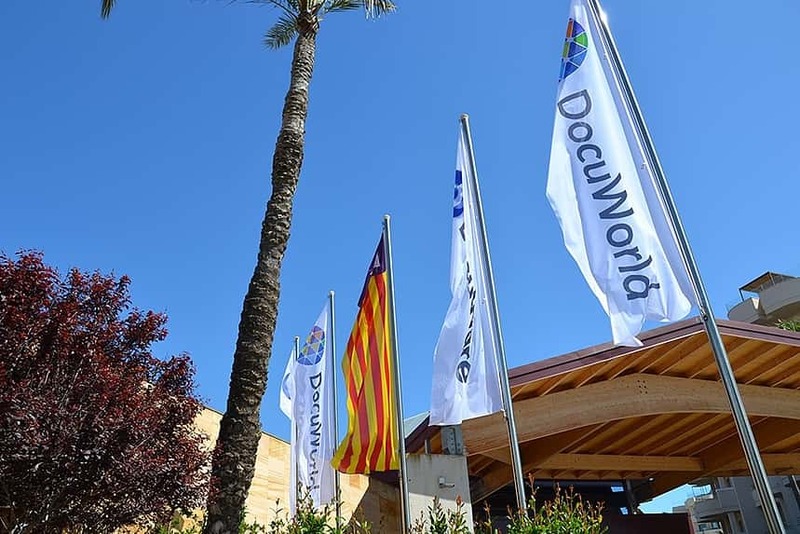 Read the latest about DocuWorld Europe 2019 in Sa Coma, Mallorca (April 9-11, 2019) on our special event website: https://start.docuware.com/de/docuworld-europe.